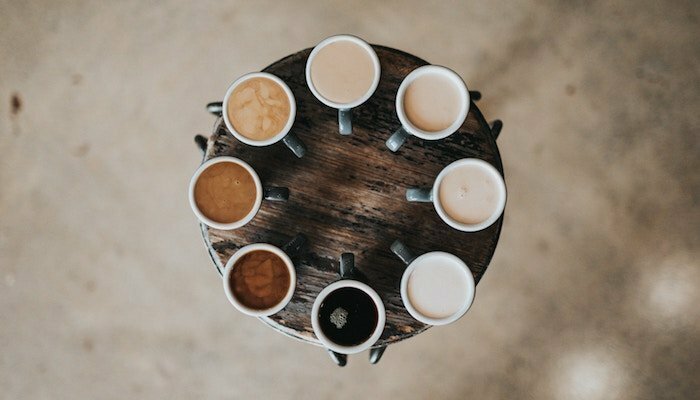 Social media marketing, email marketing and newsletters, blogging, SEO or leaflets – when it comes to promoting your small business, there are lots of platforms to choose from. But how do you choose the right marketing channels for your small business? Getting traction from any marketing activity takes time and often money. So this is not a decision you should make lightly. That’s why I’ve put together 4 simple questions that will help you make the right choice! 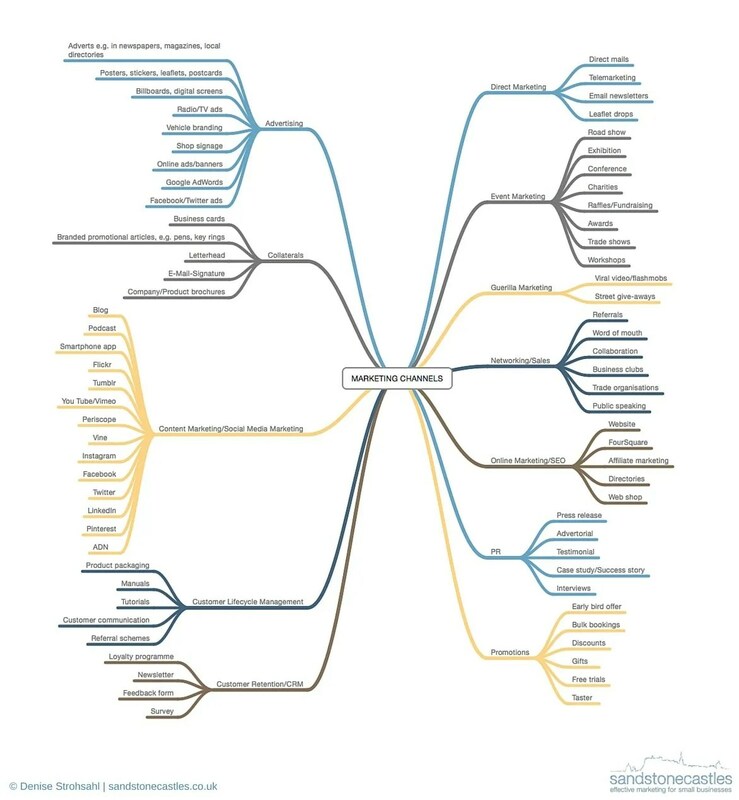 To give you an idea of what you’re up against when you have to choose the right marketing channels for your small business, check out my mindmap (click to enlarge). This lists the most relevant marketing channels for small businesses. As you can see, there’s plenty to choose from. But where do you start? There are 4 main criteria that I use to choose the right marketing channels for my clients. 1. Is your audience there? This is the key to any marketing you do to grow your small business: You want more customers, so you need to be visible to them. And that means hanging out wherever they hang out. Are they using email a lot? Which social media platform are they on? What magazines are they reading? How does a typical weekday and weekend look like for them? What activities do they engage in when they’re not working? For the best exposure and results, ask yourself if you’ll be reaching the right kind of people before choosing a marketing platform. This can be your ideal clients, potential collaboration partners or potential new team members, depending on what you want to achieve. Looking at your target audience will ensure you’re spending your time and money on the right things. And that applies to all marketing activities, whether you’re considering exhibiting at a trade show, trying a new social media platform or attending a local networking event. Read more about how to define your small business’s target market. Keep in mind that, while money is an important factor in all marketing decisions, you are investing a lot more than that. When you choose the right marketing channels for your small business, never forget the time, expertise and staff you’ll need. Regardless if you’re planning a customer event or to refresh your shop signage, always do a reality check to see if it’s worth it. When planning your marketing campaign, compare the anticipated profit to the total cost. And make sure to take the whole lot into account: For an advert, for example, you won’t just have to pay for the placement in the publication but also for copywriting and print design. When deciding if a particular marketing idea is worth investing in, ask yourself: Is it effective enough to justify the effort required to make it work? And don’t just think about the immediate return; consider what this could mean for your business in the long term. Before you start, check you have everything in place to make it happen – processes, budget, staff, goods and equipment. Also, make sure you’re able to deal with the response to your marketing campaign. Apart from having the time and money to get the show on the road, you have to able to manage the number of enquiries, orders or entries that come in. If a product campaign results in hundreds of orders, can you handle them? Most marketing campaigns drum up interest for your services or products. But never forget that this interest only gains momentum if you can actually deliver. So make sure you’re all set before starting. And if you’re not ready yet, start small and choose a marketing channel that will grow your business more organically. I’m convinced that we should stick with what we’re good at. And failing that at least avoid the things we really don’t like doing. The results show how much we enjoy things – or how little, depending. So when it comes to finding the right marketing platforms for your business, there are two things I always tell my clients: 1. There’s no way you can avoid marketing altogether. 2. You can pick and choose what you like best. So before you follow the latest marketing trend or get started with a new platform, ask yourself: Do I like it? Is it something I will enjoy doing or at least be good at?